The Roller Chain Breaker for ANSI chain sizes 25 through 60. (¼" through ¾" pitch) Take apart chain ANSI size 25 through 60 quickly and easily without hammers or punches. This quality hand tool is made in the USA using hardened steel parts for long lasting reliability. 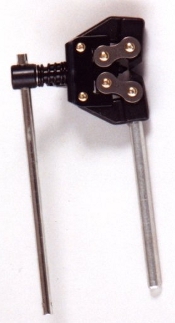 Place jaws of tool over roller with push-out pin centered on chain pin. Tighten down by turning top handle clockwise until chain pin loosens, driving it partially through the link plate. Follow the same procedure on other pin of the same pin link. Return to original pin and force completely through pin plate. Do the same on second pin, freeing link plate from the pins. Remove disassembled pin link from the chain. Its that simple!